The introduction of a bill is the same as its First Reading. When the Bill is introduced, the Clerk of the House reads the short title of the Bill. The Rules and Business Committee then sets a date for its Second Reading. The second reading is the stage where the bill’s general merits and principles are debated. If the bill is read the second time, the House is deemed to have approved the bill in principle. On the other hand, if the bill is defeated on the floor of the chambers at the second reading, that will be the end of the bill. Note that when the Bill is read a second time, it is referred to a Standing Committee unless a decision is made to commit it to the Committee of the Whole House for consideration. Following the second reading, bills are submitted to the relevant committees for further consideration and public hearings where necessary. The committee may approve the bill unaltered, amend it, rewrite it or even block it. When the Committee is done with the Bill, it presents its report to the House. If it is adopted, the Bill progresses to Third Reading. Note that when a bill originating in either of the Chambers has been read the third time, a Clean Copy of the bill signed by the Clerk, and endorsed by the Presiding Officer of the originating Chamber, shall be forwarded by its Clerk to the Clerk of the other Chamber, with a message that it desires its concurrence. agrees to the bill, but with its own amendments; a conference or harmonisation committee will be constituted comprising members of both chambers with the duty of reconciling differences on the bill and proposing a single position that would be adopted by the plenary of each Chamber. After the recommendations of the conference committee are adopted, the bill then moves on to the assent stage. Here, the Clerk of the National Assembly sends a copy of the “clean bill” to the President for his assent or signature. If the President is satisfied with the bill, he gives his assent, but where he rejects or vetoes it, or does not communicate his assent to the bill within 30 days from the date the bill was sent to him, the National Assembly by a two-thirds majority vote can override the veto. 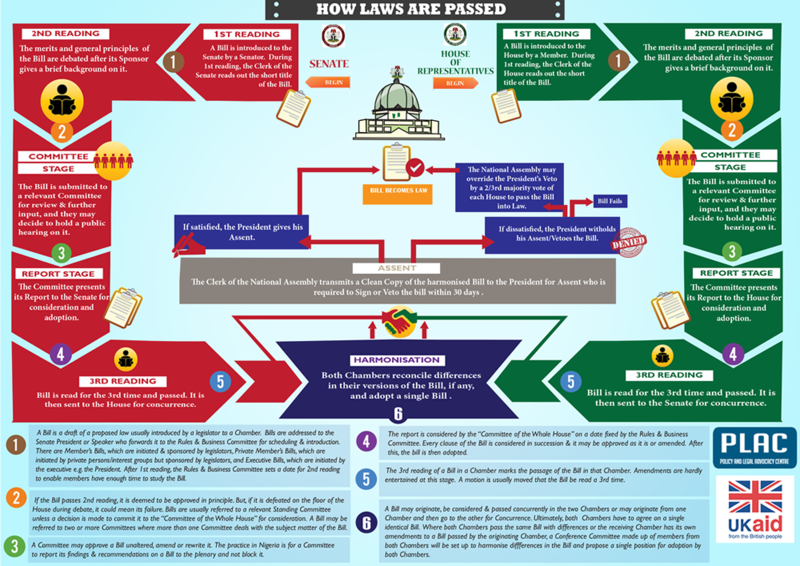 It is important to note however that there are unique procedures for passing specific types of bills such as the Appropriations Bill or National Budget and a bill seeking to amend the Constitution.